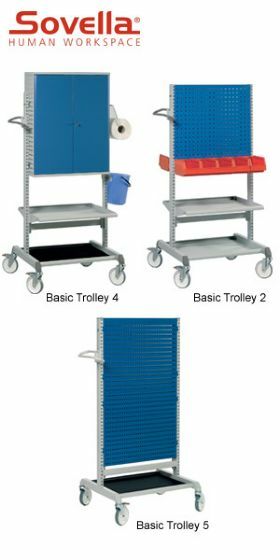 Trolleys for heavy industry can support extremely heavy loads and yet be easily transported. Rolls on large 5" casters. Load capacity of 700 lbs. Pegboard panels on both sides of the trolley provide 20 sq. ft. of panel space for tool storage. Uses Sovella pegboard hooks (sold separately). FOB Shipping Point.